1.7 Is the iCarbot right for you? What if you could ride down to the subway station, then bring your car with you on the train? No need to go without wheels when you get to your destination. No need to pay for parking. Your transportation is always with you when you want it. It’s not a Segway, it’s not a skateboard or a hoverboard, it’s something completely new. It’s an electric scooter called the iCarbot. F-Wheel Technology, maker of electric-powered unicycles, released this 4-wheeled innovation in 2016 and it’s rapidly gaining popularity, especially since the Walkcar is still in production and not available yet. The iCarbot uses sensors to move and turn as you shift your center of gravity. It has four wheels for stability with a base wide enough to support both of your feet at once. All you need to do is stand and lean to ride. Let’s take a closer look at the iCarbot now. Ride into the future with your own portable walkcar. It fits into a bag or backpack so you can bring your wheels with you. But without a steering wheel or handle, how does it know where you want to go? You may have noticed the term “somatosensory” in the description of the iCarbot. This means that this electric scooter is sensitive to touch. It responds when you shift your weight to guide it. This is similar to the technology of a Segway. The iCarbot’s front two wheels are powered by the rechargeable Samsung lithium-ion battery and coreless motor. As you lean forward and put more pressure on the front of the board, the scooter accelerates. It can go as fast as 12km/h, or 7.46mph, which is twice as fast as a quick walk. The battery will last up to 12 miles travel on one charge. Most of us walk less than 5 miles a day, so the iCarbot could transport you all day long wherever you want to go. The rear wheels provide support and make it easier to balance on the board. As F-Wheel Technology points out, having four wheels is easier and safer than riding a two-wheeled self-balancing scooter. Of course, these are small wheels, so the iCarbot works best on smooth sidewalks and paved streets. You can also enjoy it indoors around the house or office. The maximum incline that the iCarbot can climb with a rider onboard is 15 degrees. That’s pretty steep considering that most exercise treadmills top out at that slope. What’s great about this little scooter is that it’s got a zero-turning radius. It literally turns on a dime. If you’re on a crowded sidewalk, that’s very helpful. You can ride the iCarbot year-round because it’s water-resistant and it operates well from 32 to 104 degrees F. It has a magnesium alloy frame to keep it lightweight and strong. Of course, the aluminum and plastic parts are rust-resistant. In fact, the ABS plastic shell is also resistant to fire. Besides the fact that you can control the iCarbot with your movements, you can also use an app on your Android or iPhone smartphone. The app links with the scooter through Bluetooth and reveals data like the status of the battery charge, the battery temperature, your current speed, and miles traveled. 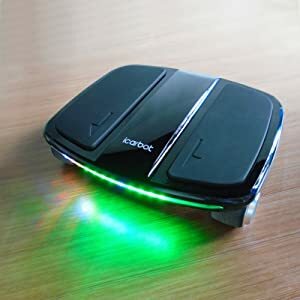 Plus, you can control the multicolor light strip on the front of the iCarbot, calibrate the sensors, and lock the scooter so it can’t be used without your authorization. We like the lighted strip on the front because it looks cool, but more importantly it’s a safety feature to make the rider more visible. It’s not bright enough to serve as effective headlights, but it does help some. It’s probably best to bring or wear an additional light if you plan to ride at night. As a bonus, there are also brake lights on the rear. You can also control those with the app. F-Wheel Technology recommends that children under the age of 7 not ride the iCarbot for safety reasons. This seems smart simply because young children don’t usually have enough fine motor skills to control a self-balancing scooter. The app lets parents set a speed limit on the iCarbot and offers a remote shutdown. Right now you can use your phone as a remote control to operate the iCarbot without a rider and also share your status on social networks. If you have a question or problem, you can use the app to contact F-Wheel directly. F-Wheel says they plan firmware upgrades with new features in the future. If you’re concerned that this scooter is aimed more at children than adults, rest easy. Take a look at these specifications: The top platform measures 15.35 by 12.6 inches, large enough for most shoes to fit. The iCarbot supports up to 264 pounds of weight. It weighs 12.13 pounds itself. All of these facts and figures mean that adults can easily enjoy the iCarbot too. 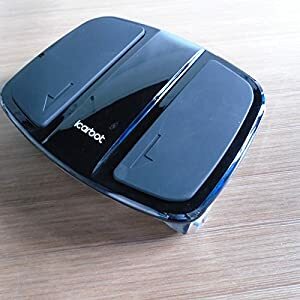 When you first receive the iCarbot, the box typically contains the battery, the UL-certified charger, and the user’s manual. Please note that some resellers do not include the battery and charger in the box and require that you purchase those separately. We’ll point those out to you in the listings below. Before your first ride, plug in the battery to charge. Although it typically takes just 2-1/2 hours to refill, let it sit for at least five hours the first time. We know it’s hard to wait because you want to play. But be patient and condition the battery properly so it will last as long as possible for you in the future. One neat trick about the motor and the battery is that you can charge up the battery a little each time you brake. Check out the owner’s manual. Watch a few videos online. Then when the battery’s good to go, practice before you hit the street. It will probably only take a few minutes to get the hang of how to ride and balance, especially if you’ve ridden scooters or skateboards before. When you climb up a slope or go over a small bump like the lip of a sidewalk ramp, lean forward slightly. If you need to stop, step off. The iCarbot should come to a halt when it senses you’re no longer riding. When riding down a long, steep hill, it might be best to use the app to set the speed limit, at least until you’re confident in your ability to ride well and stop when needed. F-Wheel Technology offers both black and white iCarbots. Get one that matches your personality, or get both and share one with a friend. F-Wheel covers the iCarbot with a one-year warranty. We like the iCarbot. It’s innovative, it’s built with attention to details, and it has a reasonable price and a 1-year warranty. By attention to details, we mean that F-Wheel Technology has gone to the trouble to get their charger UL-listed. They built the shell of the scooter with fire-resistant plastic. The battery they use is from a well-known company. While the English in their user’s manual leaves some translation to the imagination, it’s not too hard to understand. The iCarbot fills the hole that the Walkcar from Cocoa Motors is leaving while the world awaits their product. Overall, the iCarbot is the herald of personal portable transport in the future. It’s easy to use and easy to bring along when it’s not being ridden. Is the iCarbot right for you? If you’re a fan of scooters, skateboards, Segways, and other means of personal transport, we say yes! As long as you can stand and don’t have difficulty balancing, you’ll enjoy it. It’s best used indoors, or on city sidewalks and paved roads. There’s no off-road model yet, but who knows what the future will bring? The iCarbot combines the best parts of many other things to make a new personal transporter. It isn’t a Walkcar because that’s a different company based in Japan. But it is similar to a Walkcar because it’s portable and has four wheels. The best part is that the iCarbot is available now. You won’t have to wait for production to finish. It isn’t a kick scooter because it’s a powered device. You don’t have to push off the ground to make it go. There’s no pedaling or shifting your weight other than just leaning gently to indicate your desired direction. It isn’t a hoverboard because those have only two wheels. 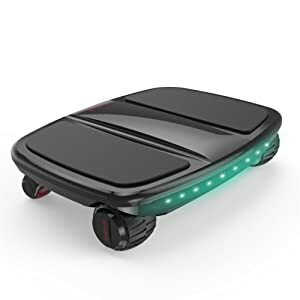 In fact, a hoverboard is often called a “self-balancing scooter” because the rider has to balance even more on one of those than someone enjoying an iCarbot. It’s more portable than a kick scooter or a hoverboard because you can literally put it in your bag and bring it with you. You can travel twice as fast as a person in a hurry can walk. The rechargeable battery doesn’t pollute the environment like a motor scooter or a car. And it can go three or four times as far on one charge than the average person walks in a day. So what is this iCarbot thing, anyway? In short, the iCarbot is a new way to travel. F-Wheel Technology was founded in 2012. Their research and design offices are located in Shenzen, China. Their products are manufactured in Zhengzhou. We mentioned that some resellers do not include the battery. This makes the cost look lower at first, but then you still need to but the battery and charger from them. You might as well buy the complete package like the one we described above. We hope you enjoyed our in-depth review of the iCarbot walkcar electric scooter hoverboard today. It’s a fun product that gives us a peek at a bright and wonderful future in personal transporters. Check back soon for more awesome gadget reviews! Illegal to ride skateboards but ok to ride a laptop with wheels? Wtf? I was looking at a brand called VeraX. I am not finding any reviews on it and I could really use an experts opinion. It has the Samsung UL Battery, over heating protection and from what I’m reading sounds good but I just don’t know, can you provide me with an insiders view please. Yup Nice ! thanks a lot. Look at the first one much cheaper than other sites and can go many miles off 1 charge. I dunno man… New inventions these days are cool, but their names are so misleading: Hoverboards that don’t hover; the Half Bike which is really a tricycle; now the Walkcar which isn’t a car nor does it walk. ???? Anyways, I do like the fact that it seems very compact and simple to operate. I assume there’s a weight limit, and maybe the really heavy guys (like sumo wrestlers) would use one for each foot. ???? I would like to see one of those that works good going up to the hills, not in flat streets. It’s hard when you have to go up ???? Thank you , nice info ! it’s hard to go up, but once it does OH MY GOD YOU’RE REALLY GONNA FEEL IT…. iCarbot is a 13-inch laptop-sized car that weighs only 2.8 kg, built with a carbon body. It reaches a top speed of 16km/h. One charge will give you one hour of riding time. There is no steering wheel or remote control device, but by simply shifting your weight on WALKCAR’s flat body, you can go in any direction. When you want to stop it, you just step off. It is available at US$600 because started shipping from September 2016. No. Not a car. Cars have windshields and doors and a lot more of a barrier should you get hit by something. These are ultra fancy skateboards. nice gadgets ! yeah, it carries you, but a carriage is STILL more protective than this. I guess Wall-E had it right. Humanity will all be obese in floaty chairs. They already have chairs like that, so I can feel you on your comment. Need bigger one for when people get more fat like me ???? I have to order a couple . we so needed some of these in Melbourne!!! I like it but only one hour ride time between charge? $500? I could see this being a huge hit at 600-700 with 3 hr life. Otherwise, I might get one, but I won’t be thrilled with my purchase. Thanks for your order 🙂 Keeps people sociable – Could get to work then charge it up again – I really like it !